If you viewed the premier of Daredevil on Netflix, you’ve witnessed one of the costume designs of the most underestimated character in the Marvel Comics Universe. Daredevil is the alter ego of blind attorney Matt Murdock. After losing his eyesight as a child, he developed his other four senses (touch, hearing, smell, and taste) and learned to overcome all of his trepidation, becoming the “man without fear.” His main villains were Kingpin (from Spider-man and The Punisher) and Bullseye. 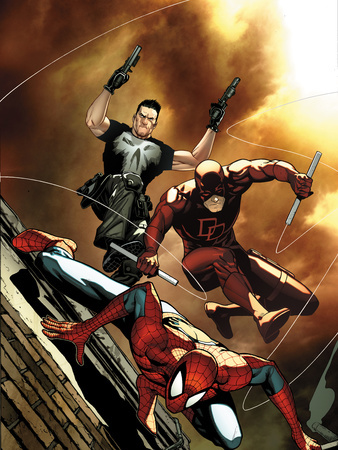 Over the years, different artists worked on the comic book series. 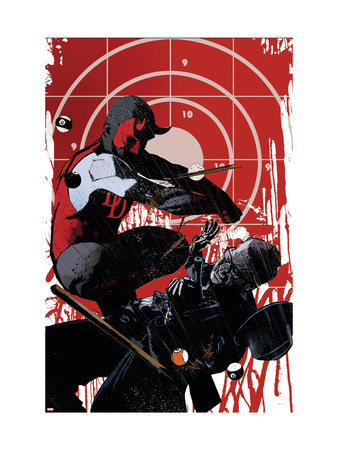 Although most of the illustrators maintained the trademark red suit, adorned with two “DD” letters on his chest accompanied by a modified walking stick, Daredevil’s costume has undergone various designs. Browse the next set of pages to view the previous phases of the character and marvel at the comic artwork rendition of the superhero as seen through the visions of various illustrators. Daredevil’s first appearance in 1964 featured him adorned in a red and yellow costume, swinging from buildings using a modified walking stick and performing mesmerizing aerobatic movements. It was believed by one historian that the legendary Jack Kirby designed the first Daredevil costume, lasting only for six issues with the red costume debuting in the 7th comic book of the series. 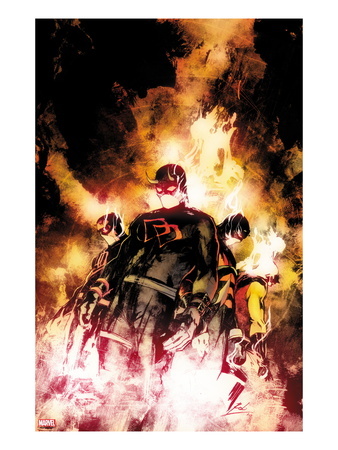 Marvel Comics created another alternate universe series featuring Daredevil, called Noir. In this particular comic book series, Matt Murdock is an actual performer who dons the Daredevil costume and takes revenge on criminals. Wearing a black spandex head covering and pants, a red mask sporting horns at the top and a red sleeveless shirt. The comic book writers of this series asked: what if the roles were reversed and Daredevil was recruited into a ninja organization called “The Hand”? 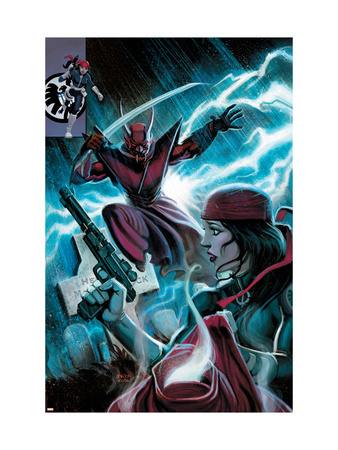 We see Matt Murdock, as the Daredevil, adorning a red ninja suit and wielding a sword—hunting down ex-lover Elektra. Looking for More Daredevil Posters? 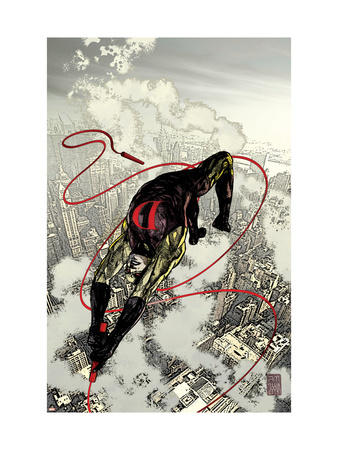 Want to view more Daredevil posters? At Allposters.com, we carry a large assortment of comic book poster artwork featuring the “man without fear“. Find the right poster for your space today! Next Another “Rocky” Movie Sequel?